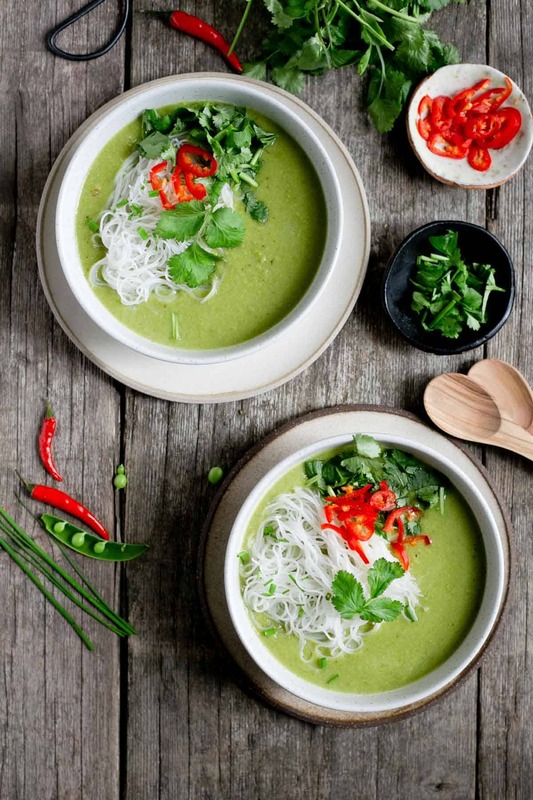 This beautiful and really easy Thai style pea and apple soup is packed with aromatic flavours. Ready in just 30 minutes, and made using only 7 ingredients! Hello! And welcome to the new post! I feel like I haven’t been here for ages, and the last two weeks have been some kind of a mad blur! 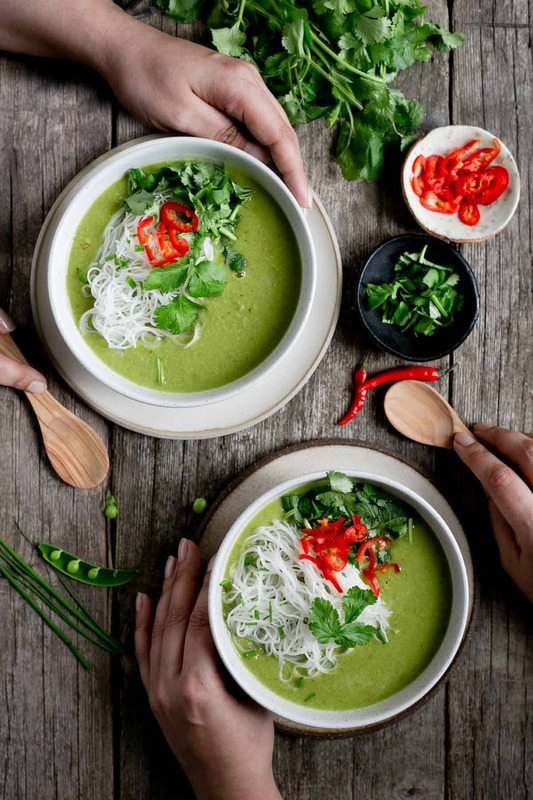 But I’m back, and I have this super easy, but super aromatic and ideal for this time of the year, Thai style pea and apple soup recipe! With really high temperatures (it was 30 C at some point, which we barely get in the summer), the last thing you want to do, is to be standing in the hot kitchen, cooking. And I believe I will speak for everyone, when I say that naturally, when it gets warmer outside, we all fancy lighter, quicker and easier dishes. And this pea and apple soup is just that! All that it takes to make it, is some frozen peas, apples, green curry paste, stock, red chillies and coriander leaves. This version lists rice noodles as one of the ingredients, but the soup will also taste great on its own. 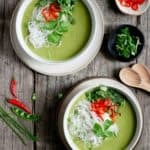 So if noodles are not your thing, you can still enjoy this flavoursome pea and apple soup, just simply skip them from the list. 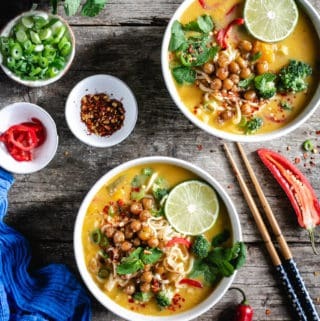 This dish is using very simple ingredients, but it’s totally bursting out with fresh and aromatic flavours, so typical of Thai kitchen (and if you are a fan of Thai flavours, make sure to check out this Thai Red Curry Noodles recipe!). The combination of peas and apples may sound a bit odd, but trust me, these two compliment each other so well! 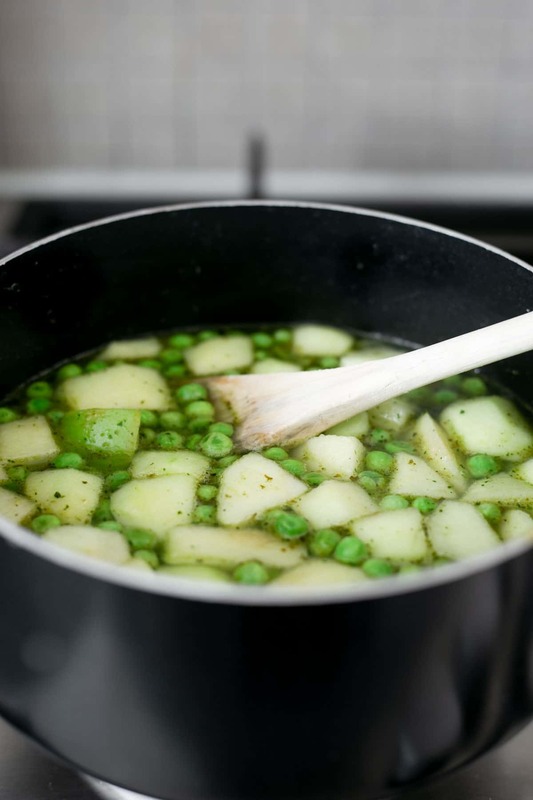 Sweet peas and crisp and sour green apples work wonderfully together, so please, please, please do not dismiss this soup just because of it’s ingredients! 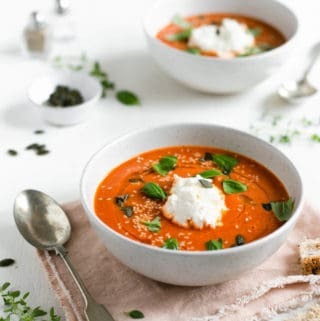 This soup will make a great quick and healthy lunch, especially on a warm day, as it will fill you up, without feeling heavy or sluggish after. It’s a perfect dish to have at any time of the year really, but the flavours will definitely take you back to the exotic holidays and sunny days! As always, let me know if you try this recipe in the comments below! Talk soon! Oh, and in case if you are wondering, the weather is now back to it’s usual self, grey skies and rain! 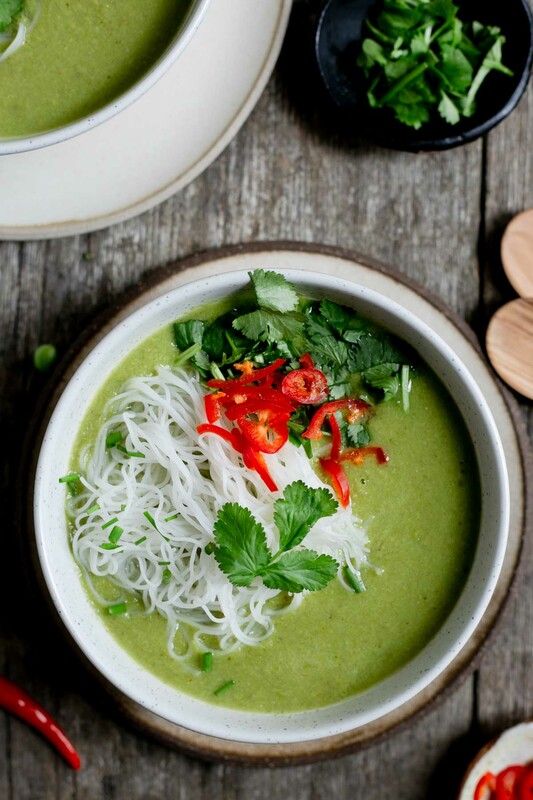 Incredibly easy to make pea and apple Thai style soup, made with only 7 ingredients, bursting with fresh spices and flavours! Peel and core the apples, then dice them into a small pieces. 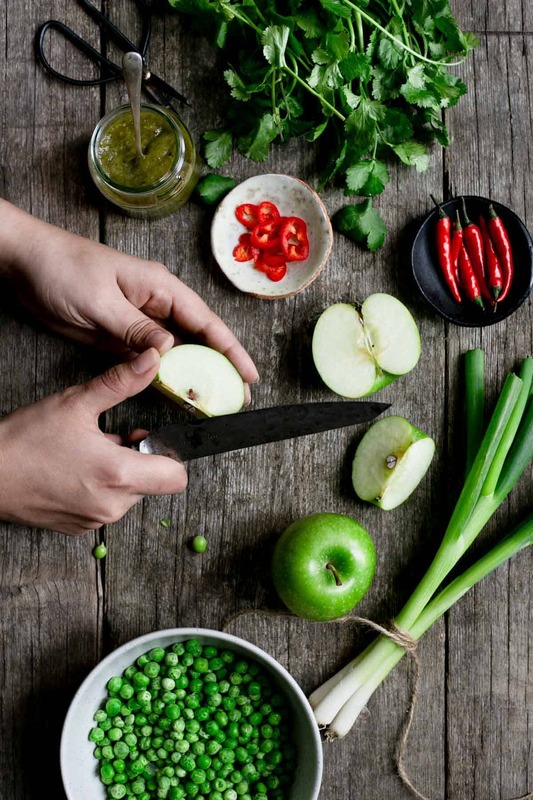 Place the apples, frozen peas and green curry paste in a medium pan over a medium heat and saute them for a couple of minutes, until aromatic. Add vegetable stock, then bring to boil, reduce the heat and cook until apples are soft, but still remaining their shape. Take off the heat and using a stick blender, blend until smooth and creamy. Pour the soup into individual bowls, then add rice noodles and garnishes- red chilli and coriander leaves. Enjoy! Such a vibrant and delicious soup. My family is going to love it. Definitely making it this sumner. Your photo are so spectacular ?? And you right, summer time is all about quick easy meals. This is perfect ? Thank you so much for your kind words and for visiting Esha! And to hear that you will be trying this soup recipe with your family just made my day. I’m so pleased and happy to read that! Anything Thai Style is my fav!! Love the combination of peas and apples in this soup. It looks beautiful too! Jess, I’m totally the same, anything with Thai flavours and I’m, all over it! Glad you like this recipe, and so happy to hear from a fellow Thai food lover! Thanks so much for stopping by! What a great soup! Love the flavors you have in it! I will be making this very soon! Thanks so much Krista! Hope you will enjoy it as much as I do! And let me know if you try it! Ok that is the shortest recipe I’ve ever seen for a recipe that’s as magnificent as this!!! I am absolutely stunned and cannot wait to try this. So, so delicious! Oh wow, Tina, thank you so much for your kind words! I’m so happy to hear all of that, and it really is one of the simplest recipes ever! Hope you will try it some time soon, and let me know if you do! Yum!! Even my husband will love this one! Thanks Darcey, I hope he will! Thank you Sue, it really is! 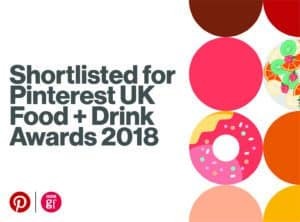 The flavours will make anyone’s taste buds very happy! I love pea soup! And I love Thai food! I never ever would have thought to combine them for this delicious and beautiful soup! I can’t wait to make it! Hey Elaine, that’s so great to hear! And I know what you mean, at first this combination sounds a bit strange, but ohhh, they work so well together! Hope you will like it! Thai food is so delicious. I love the sounds of the flavours in this delicious soup. This is a must try for sure. That is so true Gloria! Thai food is genuinely one of my favourite things in the world, and I’m so happy to hear you will be trying this recipe! Thank you. 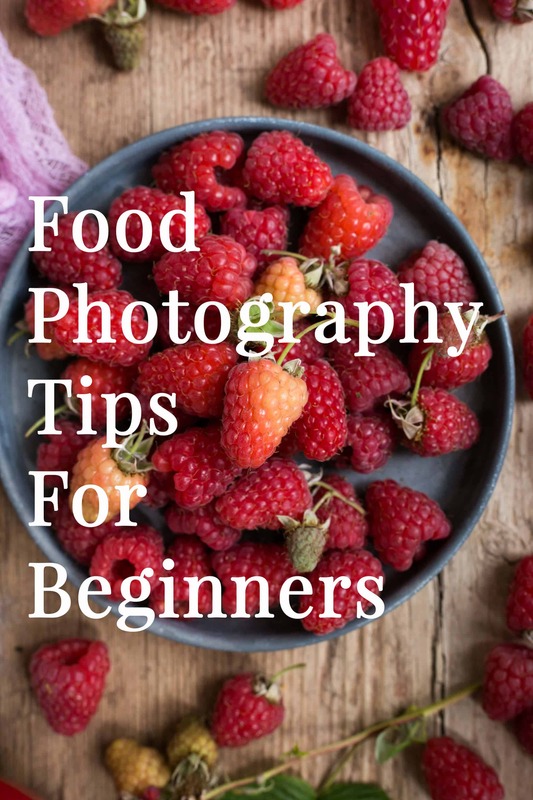 I love everything about this post!From the gorgeous pictures down to the recipe. I have never had a thai soup with apples before and I cannot wait to try it. I love granny smith apples in curries and can totally see how the flavours could work together. It’s so great to hear that you like this recipe! Granny Smith apples are so good for cooking, and are ideal to compliment any sweet flavours in any dish really, due to their sharp taste. I’ve never had it in curry, but after reading your comment, I think that’s next on my list! Quick and easy meals with short cook times are my kind of summer recipes! I love curry dishes and this sounds great! That’s right Analida! Nobody wants to be spending hours in the kitchen, when the sun is out! Glad you like the recipe, and thanks for stopping by! Now here is a flavor combination I would have never thought of…but it sounds so good! I can’t wait to try this! Thanks so much Kate! Please let me know if you do, I would love to know what you think! 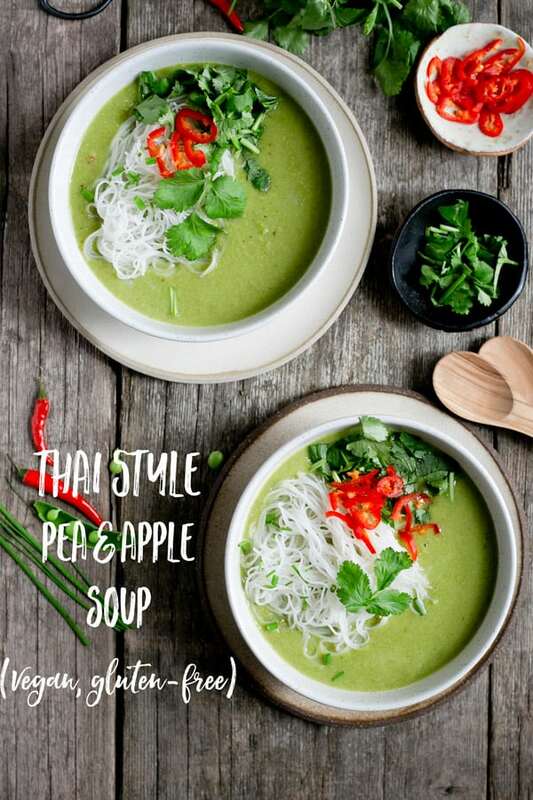 i make pea and potato soup quite frequently but your Thai version with apples sounds very very refreshing and yummy. Pea and potato sounds so tasty too Dixya! I hope you will get to try this combo woith apples some time soon! and thanks so much! 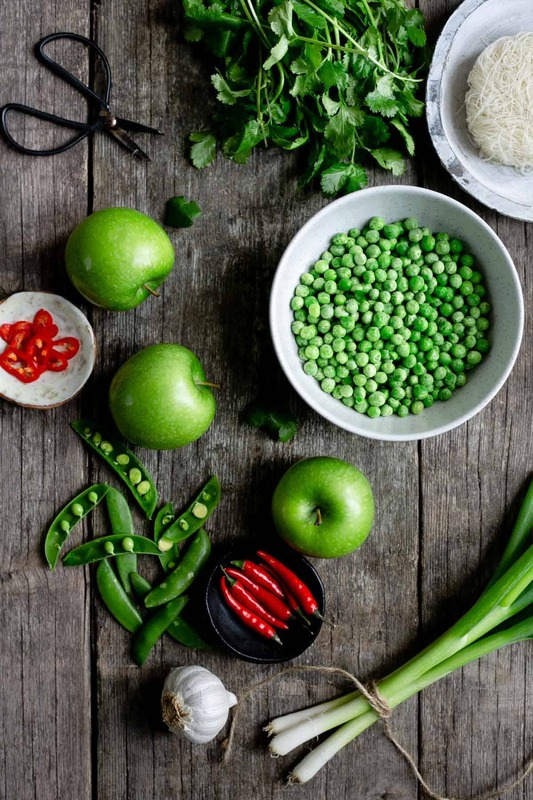 Peas and apples, such a great combo! 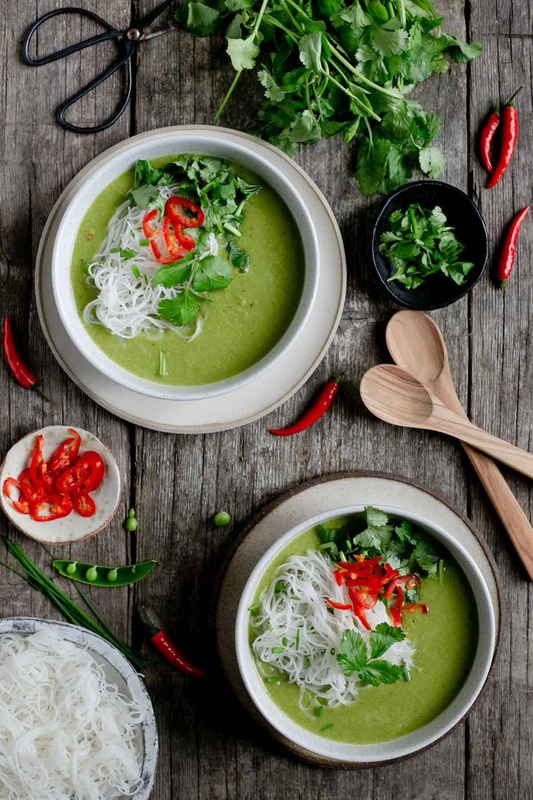 This soup looks vibrant and fresh, especially with the fresh coriander. Green curry is soo good. Beautiful pictures as well 🙂 . Fresh herbs make everything look and taste better, right? And thanks so much for the kind words Nicoletta, I’m so happy to hear you like the recipe and the photos! I love the vibrant green color! I almost never make soup at home, and almost never eat it when it’s not the depths of winter. But this? I may have to make an exception! 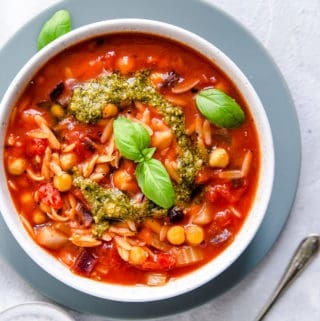 Hey Leslie, I’m totally with you on eating soup mainly in depths of winter, but this one is soooo suited for warmer days too! It’s definitely worth making an exception for! I’ve never thought of using peas and apples together, but I think it would work really well. You’ve made a gorgeous soup and I bet my family would love it. The flavors sound amazing! It’s a very unusual combination, and I was a bit sceptical at first too, but both work sooooo well, and I promise you will not be disappointed! I would never have thought of putting these flavours together. I love this idea so much, I will try it! That’s great to hear Amy! Let me know if you try it, I would love to know what you think! WOW! What an amazingly uniquely recipe…I love it! I love soups with apples…just love! And you pictures are amazing! Thanks for sharing such an incredible recipe! Printing this one off so I can make it for lunch this week! Thanks so much for the kind words! I hope you will enjoy this recipe as much as I do! Let me know! I love the green color of that soup! Such fresh tasty flavors too! Well done! Thanks Matt, so happy you like it! Thanks for stopping by! Pea and apple soup? Well color me intrigued! The color is absolutely beautiful. thank you so much Claire! Happy to hear you like it!